uuid : 0926bb30-27b3-4002-ad92-4e1d9bed984a templates_id: 119502 templates_uuid: "c10055ea-ba67-453b-b53d-1e66f248fbbb" title: "Probation letter" display_name: "Probation letter" meta_keywords: "Probation letter, Probation period, End of probation letter, Probation letter template, Probation end letter and Probation period at work." description: "
Probation periods provide an opportunity for employers to help integrate employees into the workplace. They can help employers assess an individual and their suitability within a business. 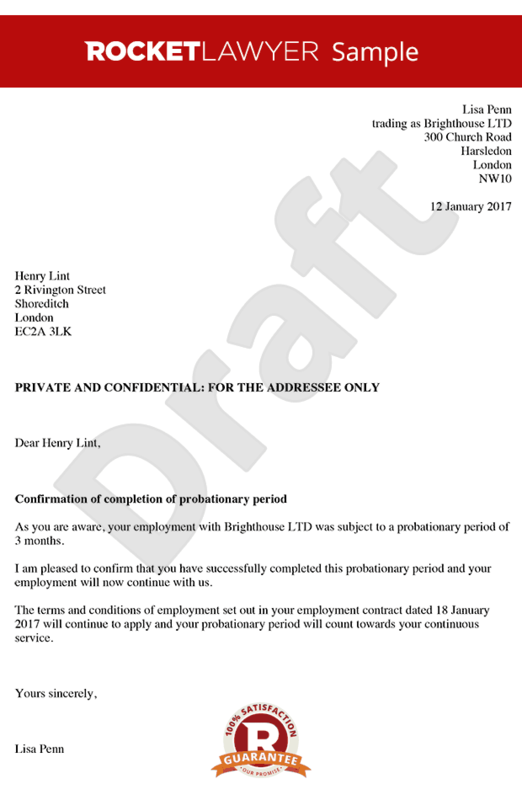 Use this probation period letter to provide an employee with written confirmation that their probation period has ended. This probation letter can also be used to inform the employee of the outcome of their probation period. What is a probation letter? A probation letter is a letter by which an employer informs an employee that their probation period has ended and tells them what the outcome of the probation is. Why do I need a probation letter? Once the performance review has been held and a decision has been made as to whether the employee shall be retained or not, it\'s important to give written confirmation of it to the employee. Issuing a probation letter ensures you keep employees informed about the outcome of their work probation, and shows you deal with their integration within the company carefully. How long should a probationary period be? Probationary periods generally last for three months, although they can be shorter - and they can also be extended. Such periods are normally included as a clause in the main employment contract. What can the outcomes of a probationary period be? have not passed their probationary period successfully. When should the probation letter be sent? The probation letter should be sent at the latest on the last day of the probation period. This probation end letter is governed by the law of England and Wales. \r\n\r\n" created_timestamp: "2018-10-08 04:36:28.0" modified_timestamp: "2018-10-08 04:36:28.0" active: true created_by: 104 modified_by: 104 dcm_id: 357 url_slug: "Probation-letter" meta_description: "Use this probation end letter to finalise the stages of a probation period. It covers if the employee will extend, pass or fail their probation period." time_to_complete: "10 minutes"
Once the performance review has been held and a decision has been made as to whether the employee shall be retained or not, it's important to give written confirmation of it to the employee. Issuing a probation letter ensures you keep employees informed about the outcome of their work probation, and shows you deal with their integration within the company carefully. More than just a Probation letter template, our step-by-step interview and guidance makes it easy to create your document. Easily create online, download, print and sign your free Probation letter in minutes. This document is also sometimes called: Probation letter, Probation period, End of probation letter, Probation letter template, Probation end letter and Probation period at work..